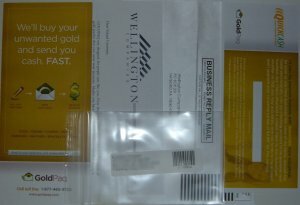 Gold Package Contents: GoldPaq sent welcome letter, an insert describing their quick cash option (nank wire transfer), a brochure explaining the steps of sending in the gold items with a personal tracking number attached to the back of the brochure, a small zip lock bag that has been labeled with the personal tacking number and your name and address, a tyvek envelope with the postage prepaid. Payment Speed: Check or direct deposit to bank. SellGoldHQ.com is an independent reviewer of precious metal brokers. All brand names, logos and trademarks on SellGoldHQ.com are the exclusive property of their respective owners and are not property of SellGoldHQ.com. If you would like to contact Gold Paq please call 877-465-3720 during 9am to 5pm EST.